Ever feel tired, bloated or itchy after eating something? Feeling tired, foggy, or like you have a cold? You're not alone. Being sensitive to different foods and additives is actually quite common now. Food allergy is an abnormal response to a food triggered by your body's immune system. Basically, your body attacks the proteins in the food and creates the allergic reaction. These allergic reactions can range from mild to severe; the most severe reaction called anaphylaxis. You may be familiar with it as it's the most dramatic and dangerous type of response the body can have to an external trigger and requires a shot of epinephrine to bring the body back from shock. About 30 percent of children with food allergies are allergic to more than one food. The eight most common allergies and often the most serious are milk, egg, peanut, tree nuts, wheat, soy, fish and crustacean shellfish. Sesame allergies are on the rise. How do I know if I'm allergic? If you are having any of the symptoms listed on this page, and definitely if you've ever had a sudden onset of a severe reaction, you are probably aware of at least one trigger. If you're unsure but think you might have allergies, your doctor or wellness center can use your medical history, elimination diet, skin and blood tests to diagnose. Sometimes you may be experiencing general digestion issues or random symptoms that aren't explained by anything else. These could likely be signs of a food intolerance. Food intolerance is different than an allergy because there is no histamine or immune response in the body. Instead, it's centered around difficulty in digesting certain foods. 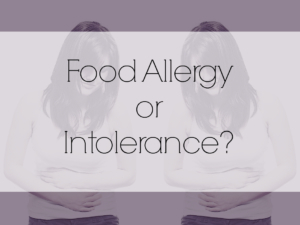 Living with food allergies and intolerances may be uncomfortable, annoying, and a little scary but knowledge is definitely power in this case! The more you know about your body and what it likes, doesn't like, and can't handle, the more informed choices you can make to feel better and reduce symptoms so you can live a healthier and more comfortable life. Speaking with your HealthCare Provider or Health and Wellness Center is very beneficial if you've been having any of the symptoms listed above. Luckily, we have the ALCAT Food Sensitivity Tests right at Saunabar! We can have a professional Phlebotomist come to your home or office to start your quick and easy (and potentially life-changing!) testing process. Choose from the Basic 237 Food Panel Test or the upgraded Platinum Plus Test. Call us and book today! Want more health and wellness? Visit Saunabar and follow this blog for tips and knowledge every week.